Salerno, 35 miles south of Naples, was older – it came into being as a medical school around the ninth century. It flowered at the time of the Crusades (1096 -1270), but nothing remains today of its existence. 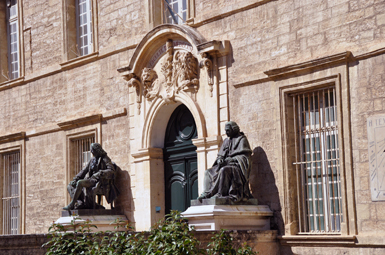 Montpellier, about 28 miles west of Nimes in Provence, has a better-documented history as the oldest, still-active medical school in Europe. Only ten miles to the Mediterranean by the river Letz, Montpellier became established around 985 AD as a village of merchants importing spices from the Levant. 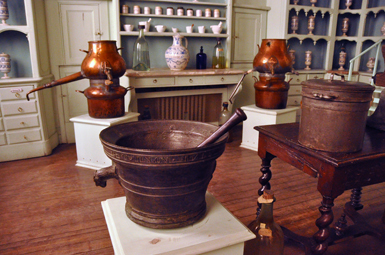 With the imports came the medical uses of their products from the knowledge of Arabic medicine. By the year 1000 AD, graduates of Salerno were teaching merchants and students in Montpellier, although much of the learning was imparted by Arab and Jewish trading partners. 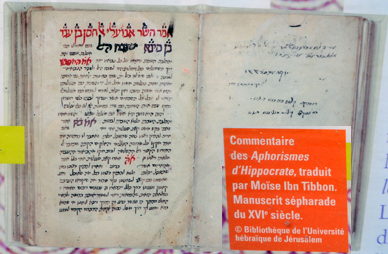 Important medical translations from the Persian teacher, Avicenna, and the Jewish rabbi, Maimonides, were made by a Jewish physician, Moses ibn Tibbon in the mid 1200s. Even today testimonials to his translations still are displayed on pharmacy windows in Montpellier. 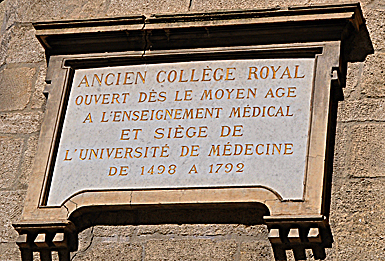 In 1180, the lord of the city, Guilhem VIII, proclaimed that “anyone, no matter their religion or roots, could teach medicine in Montpellier.” There doesn’t seem to be any reference in the records as to whether the teacher had to be qualified! However in 1220 the professors of medicine formed a Univeratas Medicorum and in 1220 Pope Nicholas IV gave the university his blessing. We wander the cobbled back streets with a guide. 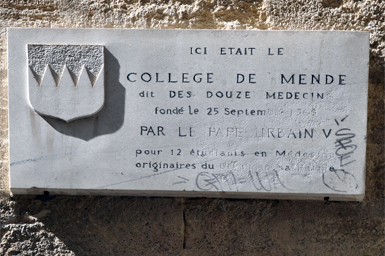 A faded plaque on the wall shows Pope Urban V brought a dozen students to Montpellier and had them educated in the art of medicine in the dwelling above us. Other teachers competed with the University’s medical staff, not unlike today. A Royal College formed around the corner in 1498 with private instructors and trained medical students for three centuries. However, soon after that, Andreas Vesalius was born in Brussels to become the foremost anatomist of the Renaissance in Padua, Italy in 1537. 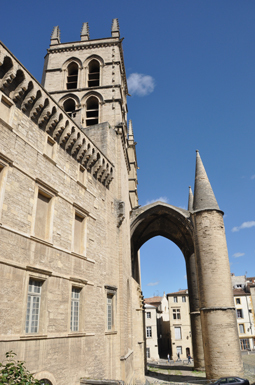 Montpellier’s medical schools were running out of space and finally moved to its present location beside Sainte-Pierre Cathedral. The church was founded in 1364 but suffered extensive damage during the Wars of Religion between Catholics and Protestants in the 16th century. It was rebuilt in the 17th century. However, contiguous with the cathedral is the medical school whose entrance is dominated by the statues of two of its most famous professors. Peyronie (1678-1747) on the left, graduated as a master barber-surgeon on 1695 at the age of 17 years and in 1736 became surgeon to Louis XV. Peyronie described the penile fibrosis of the corpus cavernosum the disease named after him in 1743 (the year the barbers separated from the surgeons!). On the right sits Barthez (1734-1806). He graduated at the age of 20 and by 1756 had written more than 2,000 articles on medicine and anatomy. Even in those days it was “apparently publish or perish.” Barthez became Chancellor, also received a degree in law and, fluent in many languages, had a huge role in making Montpellier’s medical school famous. 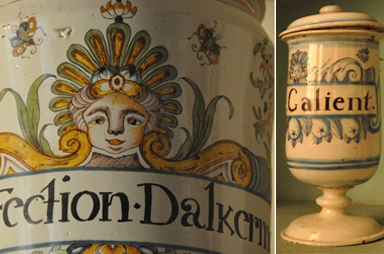 Montpellier still clings to its past. 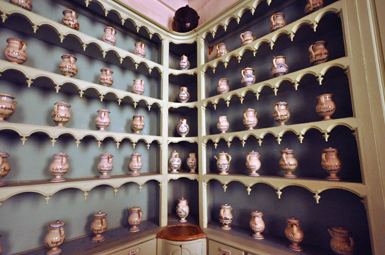 In the ancient pharmacy of the Chapel of the Work of Mercy where pharmacists handed their prescriptions through unobtrusive hatches to the reticent nuns who administered to the sick, bottles still stand on shelves. I read "S.de Digitale," "S.de Quina" and something called "Galient." “I understand digitalis and quinine but what is that third one?” I ask the guide. “It’s one of Galen’s medicines,” she replies. Montpellier, the 8th largest city in France with a population of 250,000, has both good air service and a fast train TGV schedule from Paris. Its tourist office is one of the most efficient in France. Eric Anderson, Physician's Money Digest's resident travel & cruise columnist, is a retired MD and former president of the NH Academy of Family Practice, and now lives in San Diego. The only physician in the American Society of Travel Writers, he has also written five books, the last called The Man Who Cried Orange: Stories from a Doctor's Life.